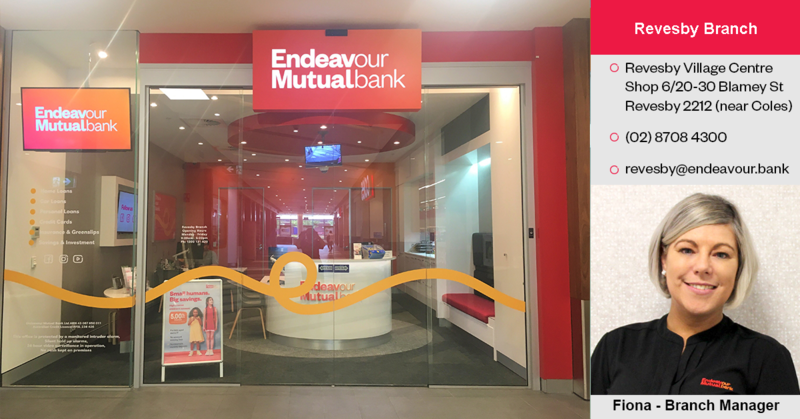 Endeavour Mutual Bank is a member owned bank that has been serving community such as the Revesby area for over 60 years whilst offering additional branches throughout Sydney and the Hunter region. Endeavour also offers free access to non direct charge ATMs australia wide, an innovative mobile app as well as a range of digital wallet options including Apple Pay, Google Pay and Samsung Pay. We are well positioned to offer very competitive products and outstanding personal service to all of its members. The Revesby branch which was firstly located in Marco Avenue Revesby for over 15 years, then temporarily relocated to within the Revesby Workers Club whilst a new branch was being constructed. In February 2016 the new branch was officially opened within the Revesby Village Centre alongside other specialty retailers such as Coles, AMF Bowling, Ekera Medical, Carnival Kingdom and a number of other local retailers. The branch now features an open plan, friendly and interactive environment, on-site loan and banking experts to handle all your banking needs as well as an in-branch iPad enabling you to perform banking transactions on the go. Endeavour Mutual Bank can cater to all of its members' banking needs. Visit the Revesby branch and meet the friendly staff. The branch is located at shop 6, adjacent to Coles. Car: Parking is available on the street or in the Revesby Village Centre car park which can be accessed from Blamey Street. Train: Revesby train station is located 100 metres from the Revesby Village Centre and our branch.